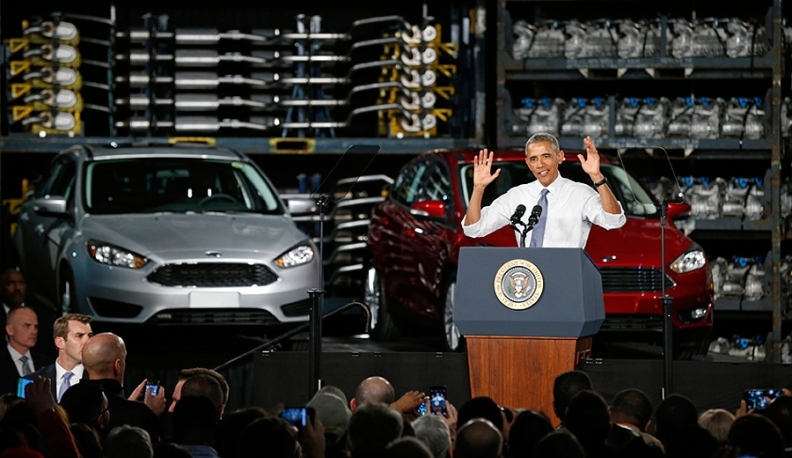 President Obama with the Focus at the Michigan Assembly Plant in January. DETROIT -- Ford Motor Co. today said its Michigan Assembly Plant will stop building the Focus and C-Max in 2018, in a sign that the automaker sees slow demand for small cars to continue in the foreseeable future. Ford did not say where it would move Focus and C-Max assembly or which vehicles would replace them at the plant in Wayne, Mich., which employs more than 4,000 workers. Both the Focus and C-Max are due to be redesigned for the 2018 model year. UAW leaders, who are scheduled to formally open talks with Ford on July 23, posted a letter to their members on Facebook saying they are “extremely confident” that Ford would assign a new product to Michigan Assembly and “maintain a full production schedule” at the plant. The news comes several weeks after Ford eliminated the plant’s third shift and began cutting about 700 jobs there. "We currently are reviewing several possible options for the Focus and C-Max and will share details once our studies are complete,” Ford spokeswoman Kristina Adamski wrote in an email. Ford currently builds the Focus in nine plants on four continents, including two in China. It was the top-selling nameplate in the world in 2013, with sales of nearly 1.1 million. Because Michigan Assembly is one of Ford’s only U.S. plants with any significant excess capacity, the announcement likely means they are headed to Mexico or overseas. Sources have told Automotive News that Ford may move its smallest car, the Fiesta, from Cuautitlan, Mexico, to Thailand in 2017, which would allow for Focus production at the Mexico plant. Bloomberg and The Detroit News reported that union members at the plant were told that assembly of the vehicles would move to a foreign country. Ford spent $550 million to convert the former Michigan Truck Plant into Michigan Assembly, a modern, flexible plant that was a centerpiece of the “small-car offensive” announced by former CEO Alan Mulally after SUV sales plunged. The cost of that overhaul and other actions was covered by a $5.9 billion loan from a U.S. Energy Department fund to encourage production of more fuel-efficient vehicles. But with gasoline prices down significantly from a year ago, Focus sales declined 16 percent in June and 3.2 percent in the first half of 2015. C-Max sales have fallen 17 percent this year. The C-Max, available as either a traditional or plug-in hybrid, has struggled to attract buyers since Ford reduced the car’s fuel-economy ratings by 4 mpg in 2013 and compensated owners for overstating its mileage in ads and window stickers.